Prairie Mining Limited (“Prairie”) and Jastrzębska Spółka Węglowa SA (“JSW”) have signed an extension to the Non-Disclosure Agreement (“NDA”) originally announced on 28 March 2018, extending the term of the NDA for an additional 6 months with the term of the NDA ending on 28 September 2019, for the purposes of continuing discussions. JSW has confirmed that its has now completed its initial Due Diligence process on Prairie and Prairie’s assets. 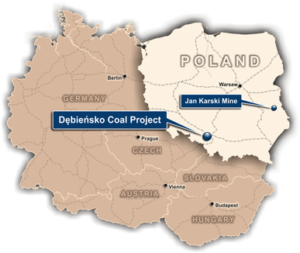 As previously confirmed, JSW’s Due Diligence at the Jan Karski project has confirmed that part of the “Lublin” deposit contains semi-soft coking coal (type 34), which can be potentially utilised by JSW. JSW’s Due Diligence has also indicated the technical feasibility and potential synergies of accessing initial seams at the Dębieńsko deposit utilising the existing infrastructure at JSW’s adjacent Knurów-Szczygłowice mine. Exploiting those synergies would require modifications to project configuration and obtaining relevant approvals, including concession modifications. JSW estimates that access via the Szczygłowice mine potentially enables the production of hard coking coal (type 35) from Dębieńsko in up to 18 months from the time that relevant administrative permits and concession amendments are granted. 2) Adaption of mine plans for both Debiensko and Jan Karski to align with JSW’s development concepts and maximise potential synergies. There can be no certainty as to whether any transaction(s) or co-operation will be agreed, or the potential form of such transaction(s) or co-operation. It is emphasised that any potential transaction(s), should they occur, may be subject to a number of conditions including, but not limited to, obtaining necessary corporate approvals, consents and approvals related to funding, consents from Poland’s Office of Competition and Consumer Protection (UOKiK) if required, and any other requirements that may relate to the strategy, objectives and regulatory regimes applicable to the respective issuers. For the avoidance of doubt, this announcement is without prejudice to Prairie’s service of a notice of an investment dispute to the Republic of Poland. Prairie will continue to enforce its rights under all applicable domestic and international laws. Prairie will continue to comply with its disclosure obligations with the relevant markets, as required. During the quarter, Prairie and JSW continued to exchange technical and commercial information in order to facilitate substantial and more advanced discussions regarding any potential co-operation or transaction(s) options in respect of Prairie’s Polish coking coal projects. Further discussions were held between Prairie and JSW while Prairie has made available information to JSW in relation to both the Debiensko and Jan Karski projects to allow JSW to conduct assessments of their feasibility and economics. Subsequent to the quarter, Prairie and JSW jointly reported that JSW’s due diligence had confirmed semi-soft coking coal quality at Jan Karski which JSW could potentially utilise, and had also indicated the technical feasibility and potential synergies in accessing Debiensko via JSW’s existing infrastructure. JSW estimates such synergies could potentially enable production within 18 months from all relevant permits and concession amendments being granted. There can be no certainty as to whether any transaction(s) will be agreed, or the potential form of such transaction(s). The Company will continue to comply with its continuous disclosure obligations and will make announcements to the market as required. Prairie continued to analyse drill hole data which will be used for engineering design of foundations of structures associated with the shafts, coal handling and preparation plant and other surface facilities. Mine site redevelopment planning continued including ongoing demolition works at Debiensko and the preparation of an infill drill program to increase JORC Measured and Indicated Resources. Prairie remains in a financially strong position with cash reserves of A$9.7 million on hand. The Debiensko mine was originally opened in 1898 and was operated by various Polish mining companies until 2000 when mining operations were terminated due to a major government led restructuring of the coal sector caused by a downturn in global coal prices. In early 2006 New World Resources Plc (“NWR”) acquired Debiensko and commenced planning for Debiensko to comply with Polish mining standards, with the aim of accessing and mining hard coking coal seams. In 2008, the MoE granted a 50-year mine license for Debiensko. In October 2016, Prairie Mining Limited (“Prairie” or “Company”) acquired Debiensko with a view that a revised development approach would potentially allow for the early mining of profitable premium hard coking coal seams, whilst minimising upfront capital costs. Prairie has proven expertise in defining commercially robust projects and applying international standards in Poland. The fact that Debiensko is a former operating mine and its proximity to two neighbouring coking coal producers in the same geological setting, reaffirms the significant potential to successfully bring Debiensko back into operation. Prairie continues to analyse the drill hole data which will be used for engineering design of foundations of structures associated with the shafts, coal handling and preparation plant and other surface facilities. These holes are essential in order to assess the soil conditions, properly design structural foundations and thus provide more accurate pricing in the tenders as required for a feasibility study. Prairie’s team have also designed an infill drilling program that when undertaken will upgrade more of the resource base at Debiensko to the Measured and Indicated resource categories and support JORC compliant reserve estimation. The Jan Karski Mine (“Jan Karski”) is a large scale semi-soft coking coal project located in the Lublin Coal Basin in south east Poland. The Lublin Coal Basin is an established coal producing province which is well serviced by modern and highly efficient infrastructure, offering the potential for low capital intensity mine development. Jan Karski is situated adjacent to the Lubelski Wegiel Bogdanka (“Bogdanka”) coal mine which has been in commercial production since 1982 and is the lowest cost hard coal producer in Europe. building a mine that creates new employment for generations to come and career paths for families to remain in the region. In April 2018, Prairie commenced legal proceedings against Poland’s Ministry of Environment (“MoE”) due to its failure to grant Prairie a Mining Usufruct Agreement over the concessions which form the Jan Karski Mine and in order to protect the Company’s security of tenure over the project. the decision provides security of tenure over the Jan Karski concessions and effectively safeguards Prairie’s rights at the project until full court proceedings have concluded. The Regional Civil Court in Warsaw has issued a verdict that forms an injunction preventing the MoE from concluding exploration or mining usufruct agreement(s) regarding the Jan Karski Mine area (including the “Lublin” deposit, as well as the former K-4-5, K-6-7, K-8 and K-9 concession areas) with any party, other than PD Co Sp. z. o.o. (Prairie Mining’s wholly owned Polish subsidiary). The Court has also ordered that the MoE does not grant any concessions (for prospecting, exploration and/or mining) to any party other than PD Co Sp. z. o.o. This highly favourable court ruling was issued in response to Prairie’s application submitted as part of the legal proceedings commenced by Prairie to protect its tenure at Jan Karski. Based on professional advice, Prairie considers that the MoE breached the GML and Polish law and is defending its position having commenced legal proceedings against the MoE through the Polish courts to protect its tenure at Jan Karski. The Company will also consider any other actions necessary to ensure its concession rights are reserved which may result in the Company taking further action against the MoE including invoking the protection afforded to the Company under any relevant bi-lateral or multi-lateral investment treaties or such other actions as the Company may consider appropriate at the relevant time. Prairie completed an Environmental and Social Impact Assessment and made submissions to the Lublin Regional Director for the Environment (“RDOS”) for an Environmental Consent decision for Jan Karski in October 2017. In the previous quarter, the RDOS issued a notice indicating that the Environmental Proceedings would be delayed further, subject to the receipt of additional information requested by the RDOS which the Company, together with its appointed environmental consultants, are working to provide. During the previous quarter, there was a change of personnel fulfilling the functions of the Chairman and Deputy Chairman of the Lublin RDOS. Due diligence at Debiensko has also indicated the technical feasibility and potential synergies of accessing initial seams at the Debiensko deposit utilising the existing infrastructure at JSW’s adjacent Knurow-Szczyglowice mine. Exploiting those synergies would require modifications to project configuration and obtaining relevant approvals, including concession modifications. JSW estimates that access via the Szczyglowice mine potentially enables the production of hard coking coal (Type 35) from Debiensko in up to 18 months from the time that relevant administrative permits and concession amendments are granted. Prairie has cash reserves of A$9.7 million. With CD Capital’s right to invest a further A$68 million as a cornerstone investor, Prairie is in a strong financial position to progress with its planned activities at Debiensko and Jan Karski. However, as of the date of this report, Prairie has not yet received the required Environmental Consent decision, which remains pending. Prairie completed an Environmental and Social Impact Assessment and made submissions to RDOS for an Environmental Consent decision in October 2017. Prairie has not been able to apply for a Mining Concession for Jan Karski due to the delay in the issuance of an Environmental Consent decision. However, the Environmental Consent proceedings continue to progress and the Company has received notice from the RDOS to provide supplementary information to the originally submitted Environmental & Social Impact Assessment. The approval of Prairie’s Geological Documentation in 2015 also conferred upon Prairie the legal right to apply for a Mining Usufruct Agreement over Jan Karski for an additional 12-month period beyond April 2018, which precludes any other parties being granted any licence over all or part of the Jan Karski concessions. Under Polish law, the MoE is strictly obligated, within three months of Prairie making an application for a Mining Usufruct Agreement, to grant the agreement. It should be noted that the MoE confirmed Prairie’s priority right in two written statements (i.e. in a final administrative decision dated 11 February 2016 and in a formal letter dated 13 April 2016). Prairie applied to the MoE for a Mining Usufruct Agreement over Jan Karski in late December 2017. As of the date of this report the MoE has not made available to Prairie a Mining Usufruct Agreement for Jan Karski, therefore breaching the three-month obligatory period for the agreement to be concluded. Legal advice provided to Prairie concludes that failure of the MoE to grant Prairie the Mining Usufruct Agreement is a breach of Polish law. Accordingly, the Company commenced legal proceedings against the MoE through the Polish courts in order to protect the Company’s security of tenure over the Jan Karski concessions. Since the MoE has not provided a decision within three months regarding Prairie’s Mining Usufruct application, the Polish civil court has the power to enforce conclusion of a Usufruct Agreement in place of the MoE. In the event that a Mining Usufruct Agreement is not made available to the Company on acceptable terms or the Company does not enter into a Mining Usufruct Agreement for any other reason, other parties may be able to apply for exploration or mining rights for all or part of the Jan Karski concession area. However, given that the Civil Court has approved Prairie’s motion for an injunction against the MoE, as described above, the MoE is now prevented from entering into a Usufruct agreement or concession with any other party besides Prairie until the full court proceeding has concluded. As previously disclosed by the Company, since April 2015, Bogdanka has made a number of applications and appeals to the Polish authorities seeking a Mining Concession application over the Company’s K-6-7 Exploration Concession and priority right (only one Exploration Concession which comprises of the Jan Karski Mine). All applications and appeals previously made by Bogdanka have been outright rejected. However, Bogdanka has made a further appeal to the Supreme Administrative Court. A court hearing for this appeal has now been scheduled for mid-November. The Supreme Administrative Court has no authority to grant Bogdanka a Mining Concession but it may however cancel the MoE’s previous rejection decision. If the Supreme Administrative Court does cancel the MoE’s decision, the MoE will be required to re-assess Bogdanka’s Mining Concession application. As discussed above Bogdanka has in the past raised several appeals challenging the Company’s title to the Exploration Concessions and Geological Documentation comprising the Jan Karski Mine. There is therefore no guarantee that Bogdanka will not seek to file further appeals to future decisions taken by government departments in the course of the Jan Karski Mine development timeline. Furthermore, Bogdanka has filed a another Mining Concession application for the K-6-7 area subsequent to the MoE not providing Prairie with a Mining Usufruct Agreement as discussed above. However, given that the Civil Court has approved Prairie’s motion for an injunction against the MoE, the MoE is unable to grant a Mining Concession for K-6-7 to Bogdanka (or any other party other than Prairie) until full court proceedings are concluded. ** Under the terms of the Debiensko Mining Concession issued in 2008 by the MoE (which is valid for 50 years from grant date), commencement of production was to occur by 1 January 2018. In December 2016, following the acquisition of Debiensko, Prairie applied to the MoE to amend the 50 year Debiensko Mining Concession. The purpose of the concession amendment was to extend the time stipulated in the Mining Concession for first production of coal from 2018 to 2025. Prairie has now received an initial and appealable, first instance decision from the MoE that has denied the Company’s amendment application. However, Prairie continues to have valid tenure and ownership of land at Debiensko. Not meeting the production timeframe stipulated in the concession does not immediately infringe on the validity and expiry date of the Debiensko Mining Concession, which is June 2058. Prairie also holds a valid environmental consent decision enabling mine construction. Prairie will appeal the MoE’s decision on the basis that its justification for denial is fundamentally flawed for a number of reasons including failure to take into account the requirements of the law and public interest in Poland, and the relevant facts of the Company and its amendment application. Prairie will strongly defend its position and continue to take relevant actions to pursue its legal rights regarding the Debiensko concession. Prairie’s legal team is in the process of preparing this appeal, which will point out the deficiencies of the MoE’s first instance decision. However, if Prairie’s appeal is unsuccessful, then this may lead to the commencement of proceedings by the MoE to limit or withdraw the Debiensko concession. Prairie also has the right of further appeal to Poland’s administrative courts. The Company will consider any other actions necessary to ensure its concession rights are preserved, which may result in the Company taking further action against the MoE including invoking the protection afforded to the Company under any relevant bi-lateral or multi-lateral investment treaties or such other actions as the Company may consider appropriate at the relevant time. The Directors of Prairie Mining Limited present their report on the Consolidated Entity consisting of Prairie Mining Limited (“Company” or “Prairie”) and the entities it controlled at the end of, or during, the year ended 30 June 2018 (“Consolidated Entity” or “Group”). · During the year, Prairie and Jastrzębska Spółka Węglowa SA (“JSW”) entered into a non-disclosure agreement to exchange technical and commercial information in order to facilitate substantial and more advanced discussions regarding any potential co-operation or transaction(s) options in respect of Prairie’s Polish coking coal projects. · A number of meetings were held during the year between the Company and JSW while Prairie made available information to JSW in relation to both the Debiensko Mine (“Debiensko”) and Jan Karski Mine (“Jan Karski”) to allow JSW to conduct assessments of their feasibility and economics. · In the latest public statement made by JSW, they reported that their due diligence had been finalised and, together with their advisors, were working on an asset valuation. They also disclosed that their completed technical due diligence of Debiensko and Jan Karski showed that both these projects meet JSW’s expectations as to the quality of coal. JSW also announced that further steps towards a possible transaction between Prairie and JSW would likely take place from October. · Mine site redevelopment planning continued at Debiensko throughout the year towards the completion of initial demolition works, pre-qualification of study contractors, and preparation for an infill drill program to increase JORC Measured and Indicated Resources. · Prairie held discussions with regional steel makers and coke producers for future coking coal sales and offtake. · Hard coking coal prices traded at price levels of ~US$180/t FOB Australia. · Market analysts forecast underinvestment in new coking coal mine development has potential to result in sustained high coking coal prices. · European Commission continues to designate coking coal as a Critical Raw Material. · Prairie continued to use modern exploration techniques to transform Jan Karski with drill results re-affirming the capability of the project to produce high value ultra-low ash semi-soft coking coal, known as Type 34 coal in Poland. Coking coal quality results announced during the year are superior to the drill results announced in May 2017, and further confirm that Jan Karski is a globally significant semi-soft coking coal / Type 34 coking coal deposit with the potential to produce a high value ultra-low ash SSCC with an exceptional CSR and a high 75% coking coal product split. · Spatial development plan approved at Jan Karski meaning the rezoning of 56 hectares of agricultural land for industrial use is complete which allows for construction of a mine site, shafts and associated surface infrastructure. o the decision provides security of tenure over the Jan Karski concessions and effectively safeguards Prairie’s rights at the project until full court proceedings are concluded. · The Lublin Regional Director for the Environment issued an official notification indicating that the process to establish an Environmental Consent decision for Jan Karski would be extended past 30 June 2018 due to further information requests to supplement Prairie’s original Environmental and Social Impact Assessment and ongoing local authority and public consultation. · In July 2017, Prairie and CD Capital completed an additional investment of US$2.0 million ($2.6 million) in the form of a non-redeemable, non-interest-bearing convertible loan note (“Loan Note 2”). · Prairie remains in a financially strong position with cash reserves of A$11 million at 30 June 2018. Debiensko, is a permitted, hard coking coal project located in the Upper Silesian Coal Basin in the south west of the Republic of Poland. It is approximately 40 km from the city of Katowice and 40 km from the Czech Republic. 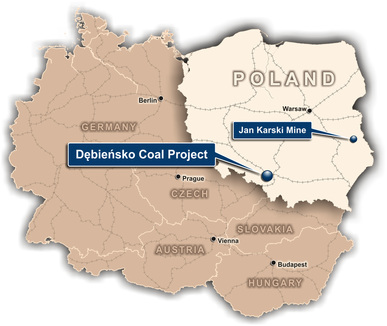 Debiensko is bordered by the Knurow-Szczyglowice Mine in the north west and the Budryk Mine in the north east, both owned and operated by JSW, Europe’s leading producer of hard coking coal. The Debiensko mine was historically operated by various Polish mining companies until 2000 when mining operations were terminated due to a major government led restructuring of the coal sector caused by a downturn in global coal prices. In early 2006 New World Resources Plc (“NWR”) acquired Debiensko and commenced planning for Debiensko to comply with Polish mining standards, with the aim of accessing and mining hard coking coal seams. In 2008, the MoE granted a 50-year mine license for Debiensko. In October 2016, Prairie acquired Debiensko with a view that a revised development approach would potentially allow for the early mining of profitable premium hard coking coal seams, whilst minimising upfront capital costs. Prairie has proven expertise in defining commercially robust projects and applying international standards in Poland. The fact that Debiensko is a former operating mine and its proximity to two neighbouring coking coal producers in the same geological setting, reaffirms the significant potential to successfully bring Debiensko back into operation. Prairie continues to analyse the drill hole data which will be used for engineering design of foundations of structures associated with the shafts, coal handling and preparation plant (“CHPP”) and other surface facilities. These holes are essential in order to assess the soil conditions, properly design structural foundations and thus provide more accurate pricing in the tenders as required for a feasibility study. Jan Karski is a large scale semi-soft coking coal project located in the Lublin Coal Basin in south east Poland. The Lublin Coal Basin is an established coal producing province which is well serviced by modern and highly efficient infrastructure, offering the potential for low capital intensity mine development. Jan Karski is situated adjacent to the Bogdanka coal mine which has been in commercial production since 1982 and is the lowest cost hard coal producer in Europe. Prairie’s use of modern exploration techniques continues to transform Jan Karski with latest drill results re-affirming the capability of the project to produce high value ultra-low ash semi-soft coking coal (“SSCC”), known as Type 34 coal in Poland whilst confirming Jan Karski as a globally significant SSCC / Type 34 coking coal deposit with the potential to produce a high value ultra-low ash SSCC with a coking coal product split of up to 75%. On 3 April 2018, Prairie announced that it had commenced legal proceedings against Poland’s MoE due to its failure to grant Prairie a Mining Usufruct Agreement over the concessions which form the Jan Karski Mine and in order to protect the Company’s security of tenure over the project. · The decision provides security of tenure over the Jan Karski concessions and effectively safeguards Prairie’s rights at the project until full court proceedings are concluded. As a result of the ruling by the Regional Civil Court in Warsaw, security of tenure over the Jan Karski concessions will be safeguarded until the full court proceeding is concluded. It is anticipated that full court proceeding could take 12 months or more to complete. To date the MoE has not provided Prairie with a Mining Usufruct Agreement for Jan Karski. Based on professional advice, Prairie considers that the MoE has breached the Polish Geological and Mining Law (“GML”) and other Polish laws and is strongly defending its position. Prairie completed an Environmental and Social Impact Assessment and made submissions to the Lublin Regional Director for the Environment (“RDOS”) for an Environmental Consent decision for Jan Karski in October 2017. During the year, the RDOS issued a notice indicating that the Environmental Proceedings would be delayed further, subject to the receipt of additional information requested by the RDOS which the Company, together with its appointed environmental consultants, are working to provide. During the year, there was a change of personnel fulfilling the functions of the Chairman and Deputy Chairman of the Lublin RDOS. During the year, Prairie and JSW entered into a Non-Disclosure Agreement (“NDA”) with respect to potential co-operation regarding Prairie’s two Polish coal projects. The purpose of the NDA was to allow for the exchange of technical and commercial information in order to facilitate substantial and more advanced discussions regarding any potential transaction(s) options in respect of Prairie’s projects. Subsequent to the end of the year, Prairie noted press articles regarding comments by representatives from JSW on possible transaction(s) between the Company and JSW with respect to Prairie’s Polish coal projects. The Company advises that discussions continue to take place as part of the exchange of technical and commercial information. Commercial discussions continue to be at a preliminary stage and that even if they move onto discussions of specific transactions terms there can be no certainty as to whether any transaction(s) will be agreed, or the potential form of such transaction(s). The Company expects further exchange of information will continue with JSW. In the latest public statement made by JSW, they reported that their due diligence had been finalised and, together with their advisors, were working on an asset valuation. They also disclosed that their completed technical due diligence of Debiensko and Jan Karski showed that both these projects meet JSW’s expectations as to the quality of coal. JSW also announced that further steps towards a possible transaction between Prairie and JSW would likely take place in October. Any potential transaction(s), should they occur, may be subject to a number of conditions including, but not limited to, obtaining positive evaluations and expert opinions, necessary corporate approvals, consents and approvals related to funding, consents from Poland’s Office of Competition and Consumer Protection (UOKiK) if required, and any other requirements that may relate to the strategy, objectives and regulatory regimes applicable to the respective issuers. The NDA, signed at the end of March 2018, provides for the initial due diligence process to be conducted until the end of September 2018, which may be extended by mutual agreement of both parties. Commercial discussions, if any, may then take place subsequent to September 2018. (i) Non-cash fair value loss of $9,884,328 (2017: $4,264,925) attributable to the conversion right of the original CD Capital convertible loan note (“Loan Note 1”) accounted for as a financial liability at fair value through profit and loss which was derecognised during the year following the conversion of Loan Note 1. The instrument was a non-cash derivative liability which was settled during the year via the issue of 44,776,120 Ordinary Shares and 22,388,060 unlisted options exercisable at $0.60 each on or before 30 May 2021 (“CD Options”) to CD Capital pursuant to the investment agreement completed in September 2015. The commercial intentions of both CD Capital and the Company were to always enter into an equity type arrangement however to be in compliance with the accounting standards, the conversion right has, up and until derecognition, been accounted for as a financial liability with the non-cash fair value movements being recognised in profit and loss. (vii) Other income of nil (2017: $650,000) which was attributable to the receipt of $650,000 in 2017 for the sale of the base metals project. At 30 June 2018, the Company had cash reserves of $11,022,333 (2017: $16,826,854) placing it in a strong financial position. At 30 June 2018, the Company had net assets of $12,445,698 (2017: $13,095,130), a decrease of 5% compared with the previous year. This is largely attributable to the decrease cash reserves and receivables which was slightly offset by the decrease in financial liabilities. Prairie’s strategy is to create long-term shareholder value by developing both Debiensko and the Jan Karski in Poland. · Continue project permitting activities including obtaining an Environmental Consent Decision at Jan Karski. Risk of maintaining project concessions – The Company’s mining exploration and development activities at Debiensko and Jan Karski are dependent upon the alteration of, or as the case may be, the maintenance of appropriate licences, concessions, leases, claims, permits and regulatory consents which may be withdrawn or made subject to limitations. The maintaining of concessions, obtaining renewals, or attaining concessions alterations, often depends on the Company being successful in obtaining required statutory approvals for its proposed activities and that the licences, concessions, leases, claims, permits or consents it holds will be renewed and altered as and when required. In this regard, in July 2015, Prairie announced that it had secured the Exclusive Right to apply for a Mining Concession for Jan Karski as a result of its Geological Documentation for the Jan Karski deposit being approved by Poland’s MoE. The approved Geological Documentation covers areas of all four original Exploration Concessions granted to Prairie (K-4-5, K-6-7, K-8 and K-9) and includes the full extent of the targeted resources within the mine plan for Jan Karski. As a result of the Exclusive Right, Prairie was the only entity with a legal right to lodge a Mining Concession application over Jan Karski for the period up and until 2 April 2018. Under the Polish GML, a Mining Concession application comprises the submission of a Deposit Development Plan (“DDP”), approval of a spatial development plan (rezoning of land for mining use) and an Environmental Consent decision. Prairie has previously announced that the DDP and spatial development plans for Jan Karski have already been approved. However, as of the date of this report, Prairie has not yet received the required Environmental Consent decision, which remains pending. Prairie completed an Environmental and Social Impact Assessment and made submissions to RDOS for an Environmental Consent decision in October 2017. Prairie has not been able to apply for a Mining Concession for Jan Karski due to the delay in the issuance of an Environmental Consent decision. However, the Environmental Consent proceedings continue to progress and the Company has received notice from the RDOS to provide supplementary information to the originally submitted Environmental & Social Impact Assessment. There are no assurances that the Environmental Consent Decision will be awarded to the Company. The approval of Prairie’s Geological Documentation in 2015 also conferred upon Prairie the legal right to apply for a Mining Usufruct Agreement over Jan Karski for an additional 12-month period beyond April 2018, which precludes any other parties being granted any licence over all or part of the Jan Karski concessions. Under Polish law, the MoE is strictly obligated, within three months of Prairie making an application for a Mining Usufruct Agreement, to grant the agreement. It should be noted that the MoE confirmed Prairie’s priority right in two written statements (i.e. in a final administrative decision dated 11 February 2016 and in a formal letter dated 13 April 2016). Prairie applied to the MoE for a Mining Usufruct Agreement over Jan Karski in late December 2017. As of the date of this report the MoE has not made available to Prairie a Mining Usufruct Agreement for Jan Karski, therefore breaching the three-month obligatory period for the agreement to be concluded. Legal advice provided to Prairie concludes that failure of the MoE to grant Prairie the Mining Usufruct Agreement is a breach of Polish law. Accordingly, the Company commenced legal proceedings against the MoE through the Polish courts in order to protect the Company’s security of tenure over the Jan Karski concessions. Since the MoE has not provided a decision within three months regarding Prairie’s Mining Usufruct application, the Polish civil court has the power to enforce conclusion of a Usufruct Agreement in place of the MoE. In the event that a Mining Usufruct Agreement is not made available to the Company on acceptable terms or the Company does not enter into a Mining Usufruct Agreement for any other reason, other parties may be able to apply for exploration or mining rights for all or part of the Jan Karski concession area. However, given that the Civil Court has approved Prairie’s motion for an injunction against the MoE, as described above, the MoE is now prevented from entering into a Usufruct agreement or concession with any other party besides Prairie until the full court proceedings are concluded. Under the terms of the Debiensko Mining Concession issued in 2008 by the MoE (which is valid for 50 years from grant date), commencement of production was to occur by 1 January 2018. In December 2016, following the acquisition of Debiensko, Prairie applied to the MoE to amend the 50 year Debiensko Mining Concession. The purpose of the concession amendment was to extend the time stipulated in the Mining Concession for first production of coal from 2018 to 2025. Prairie has now received an initial and appealable, first instance decision from the MoE that has denied the Company’s amendment application. However, Prairie continues to have valid tenure and ownership of land at Debiensko. Not meeting the production timeframe stipulated in the concession does not immediately infringe on the validity and expiry date of the Debiensko Mining Concession, which is June 2058. Prairie also holds a valid environmental consent decision enabling mine construction. Prairie has appealled the MoE’s decision on the basis that its justification for denial is fundamentally flawed for a number of reasons including failure to consider the requirements of the law and public interest in Poland, and the relevant facts of the Company and its amendment application. Prairie will strongly defend its position and continue to take relevant actions to pursue its legal rights regarding the Debiensko concession. Prairie’s legal team has lodged an appeal, which points out the deficiencies of the MoE’s first instance decision. As at the date of this report, Prairie has not received an official response in relation to this appeal. However, if Prairie’s appeal is unsuccessful, then this may lead to the commencement of proceedings by the MoE to limit or withdraw the Debiensko concession. Prairie also has the right of further appeal to Poland’s administrative courts. The Company will consider any other actions necessary to ensure its concession rights are preserved, which may result in the Company taking further action against the MoE including invoking the protection afforded to the Company under any relevant bi-lateral or multi-lateral investment treaties or such other actions as the Company may consider appropriate at the relevant time. There is however no assurance that such appeals, legal proceedings, applications (or renewals or alterations) of the Company concessions will be granted or that such applications, renewals, alterations, rights and title interests will not be revoked or significantly altered. If such appeals, legal proceedings, applications, renewals or alterations of concessions applied for are not successful or granted or are in fact revoked as the case may be in the future, there is a risk that this may have a material adverse effect on the financial performance and operations at Jan Karski, Debiensko, the Company and on also the value of the Company’s securities. · Co-operation between Prairie and JSW may not occur – Any transaction(s), should it/they occur, may be subject to a number of conditions including, but not limited to, obtaining positive evaluations and expert opinions, necessary corporate approvals, consents and approvals related to funding, consents from Poland’s Office of Competition and Consumer Protection (UOKiK) if required, and any other requirements that may relate to the strategy, objectives and regulatory regimes applicable to the respective issuers, and which could also prevent a transaction from occurring or even completing. The non-occurrence of a transaction could also have a material impact on the value of the Company’s securities. · The Company’s activities will require further capital in future years – At the date of this report, the Company has cash of approximately $11 million which places it in a strong position to conduct its current planned exploration and development activities at Debiensko and Jan Karski. However, the ability of the Company to finance capital investment in future years for the construction and future operation of the Company’s projects is dependent, among other things, on the Company’s ability to raise additional future funding either through equity or debt financing. Any failure to obtain sufficient financing in the future may result in delaying or indefinite postponement of any future construction of the projects or even a loss of property interest (in the future). The key items which the Company would require further funding in future years would be for the construction of the mines at each project. In this regard, and pursuant to the CD Capital investment agreement, CD Capital has a first right to invest a further $55 million in any future fund raise conducted by the Company, plus CD Capital will have the ability to inject a further $13 million through the exercise of their $0.60 CD Options. There is however no guarantee that CD Capital would take up this right in the future (or exercise their options). There is also a risk that the Company’s obligation to offer CD Capital a first right of refusal on any future fund raising could prejudice the Company’s ability to raise funds from investors other than CD Capital. However, the Company considers that it would not be necessary to undertake such development actions until it has secured financing to do so and the timing for commencement of such actions would accordingly depend on the date that such financing is secured. If, in the unlikely event that future financing cannot be secured, the Group has the flexibility and ability to significantly reduce its ongoing expenditure. Furthermore, the Company’s board of directors has a successful track record of fundraising for natural resources projects, including large scale coal projects, and has completed successful financing transactions with strategic partners, large institutional fund managers, off-take partners and traders and project finance lenders. There is however no guarantee that the then prevailing market conditions will allow for a future fundraising or that new investors will be prepared to subscribe for ordinary shares or at the price at which they are willing to do so in the future. Failure to obtain sufficient future financing may result in delaying or indefinite postponement of appraisal and any development of the Company’s projects in the future, a loss of the Company’s personnel and ultimately a loss of its interest in the projects. There can be no assurance that additional future capital or other types of financing will be available, if needed, or that, if available, the terms of such future financing will be favourable to the Company. If the Company obtains debt financing in the future, it will be exposed to the risk of leverage and its activities could become subject to restrictive loan and lease covenants and undertakings. If the Company obtains future equity financing other than on a pro rata basis to existing Shareholders, the future percentage ownership of the existing Shareholders may be reduced, Shareholders may then experience subsequent dilution and/or such securities may have preferred rights, options and pre-emption rights senior to the Ordinary Shares. There can be no assurance that the Company would be successful in overcoming these risks in the future or any other problems encountered in connection with such financings. · Risk of further challenges by Bogdanka – Since April 2015, Lubelski Wegiel Bogdanka (“Bogdanka”) has made a number of applications and appeals to the Polish MoE seeking a Mining Concession application over the Company’s K-6-7 Exploration Concession and priority right (only one Exploration Concession which comprises of the Jan Karski Mine). All applications and appeals previously made by Bogdanka have been outright rejected. However, Bogdanka has made a further appeal to the Supreme Administrative Court (with no court hearing being scheduled to date). The Supreme Administrative Court has no authority to grant Bogdanka a Mining Concession but it may however cancel the MoE’s previous rejection decision. If the Supreme Administrative Court does cancel the MoE’s decision, the MoE will be required to re-assess Bogdanka’s Mining Concession application. As discussed above Bogdanka has in the past raised several appeals challenging the Company’s title to the Exploration Concessions comprising the Jan Karski Mine. There is therefore no guarantee that Bogdanka will not seek to file further appeals to future decisions taken by government departments in the course of the Jan Karski Mine development timeline. Furthermore, during the financial year, Bogdanka filed a mining concession application for the K-6-7 area subsequent to the MoE not providing Prairie with a Mining Usufruct Agreement as discussed above. However, given that the Civil Court has approved Prairie’s motion for an injunction against the MoE, the MoE is unable to grant a mining concession for K-6-7 to Bogdanka (or any other party other than Prairie) until the full court proceedings are concluded. · Operations conducted in an emerging market – The Company’s operations are located in Poland and will be exposed to related risks and uncertainties associated with this jurisdiction. Changes in mining or investment policies, laws or regulations (or the application thereof) or shifts in political attitude in Poland, in particular to mining, use of coal, foreign ownership of coal projects and the movement to a nationalistic policy may adversely affect the permitting, approvals process, operations and/or profitability of the Company. The Company continues to consult with the various levels of Government but there can be no assurances that current or future political developments in Poland will not directly impact the Company’s operations or its ability to attract funding for its operations. The Company also competes with many other companies in Poland, including companies with established mining operations. Some of these companies have greater financial resources and political influence than the Company and, as a result, may be in a better position to compete with or impede the Company’s current or future activities. For example, recent legislative changes and proposed legislative changes initiated by Poland’s governing Law & Justice party have called into question the independence of the judiciary and subsequently the rule of law in Poland. In December 2017, the Council of Europe’s Commission for Democracy through Law (“Venice Commission”) found that the cumulative effect of proposed reforms to two laws and recently adopted amendments to a third law “puts at serious risk” the independence of “all parts” of the Polish judiciary. The opinion concerned two drafts recently submitted by the Polish President to the Sejm (Polish Parliament), to amend the Act on the National Council of the Judiciary and the Act on the Supreme Court, as well as recently already adopted amendments to the Act on Ordinary Courts. Additionally, and subsequent to the end of the financial year, the European Commission formally notified Poland that it had initiated infringement proceedings against the country because of the adoption of the controversial amendments to the Supreme Court Act. · The Company may be adversely affected by fluctuations in coal prices and/or foreign exchange – The price of coal fluctuates widely and is affected by numerous factors beyond the control of the Company. Coal prices are currently high compared to previous levels but there is no guarantee that prices will remain at this level in the future. Future production, if any, from the Company’s mineral properties and its profitability will be dependent upon the price of coal being adequate to make these properties economic. Current and planned development activities are predominantly denominated in Euros and the Company’s ability to fund these activates may be adversely affected if the Australian dollar continues to fall against the Euro. The Company currently does not engage in any hedging or derivative transactions to manage commodity price or foreign exchange risk. As the Company’s operations change, this policy will be reviewed periodically going forward. Unless otherwise stated, Directors held their office from 1 July 2017 until the date of this report. Mr Middlemas was appointed a Director of the Company on 25 August 2011. During the three year period to the end of the financial year, Mr Middlemas has held directorships in Constellation Resources Limited (November 2017 – present), Apollo Minerals Limited (July 2016 – present), Cradle Resources Limited (May 2016 – present), Paringa Resources Limited (October 2013 – present), Berkeley Energia Limited (April 2012 – present), Salt Lake Potash Limited (January 2010 – present), Equatorial Resources Limited (November 2009 – present), Piedmont Lithium Limited (September 2009 – present), Sovereign Metals Limited (July 2006 – present), Odyssey Energy Limited (September 2005 – present) and Syntonic Limited (April 2010 – June 2017). Mr Stoikovich is a mining engineer and professional corporate finance executive. He has extensive experience in the resources sector gained initially as an underground Longwall Coal Mining Engineer with BHP Billiton where he was responsible for underground longwall mine operations and permitting, and more recently as a senior executive within the investment banking sector in London where he gained experience in mergers and acquisitions, debt and off take financing. He has a Bachelor of Mining Engineering degree from the University of NSW; a Master of Environmental Engineering from the University of Wollongong; and a M.Sc in Mineral Economics from Curtin University. Mr Stoikovich also holds a 1st Class Coal Mine Managers Ticket from the Coal Mine Qualifications Board (NSW, Australia) and is a registered Chartered Engineer (CEng) and Chartered Environmentalist (CEnv) in the United Kingdom. Mr Stoikovich was appointed a Director of the Company on 17 June 2013. During the three year period to the end of the financial year, Mr Stoikovich has not held any other directorships in listed companies. Ms Carmel Daniele is the founder and Chief Investment Officer of CD Capital in London. Ms Daniele has over 20 years of global natural resources investment experience, ten of which was spent with Newmont Mining/Normandy Mining and acquired companies. As a Senior Executive (Corporate Advisory) at Newmont she structured cross-border M&As including the three-way merger between Franco-Nevada, Newmont and Normandy. Post-merger Ms Daniele structured the divestment of various non-core mining assets around the world for the merchant banking arm, Newmont Capital. Ms Daniele started off her career at Deloitte Touche Tohmatsu. Prior to setting up CD Capital in London in 2006, Ms Daniele was an investment advisor to RAB Capital’s Special Situations Fund on sourcing and negotiating natural resource private equity investments. Ms Daniele holds a Master of Laws (Corporate & Commercial) and Bachelor of Economics from the University of Adelaide and is a Fellow of the Institute of Chartered Accountants. Ms Daniele was appointed a Director on 21 September 2015. During the three year period to the end of the financial year, Ms Daniele has not held any other directorships in listed companies. Mr Todd was the Chief Financial Officer of Aston Resources from 2009 to November 2011. Prior to Aston Resources, Mr Todd was Chief Financial Officer of Custom Mining, where his experience included project acquisition and funding of project development for the Middlemount project to the sale of the company to Macarthur Coal. A graduate of Imperial College, Mr Todd holds a Bachelor of Physics with first class Honours. He is a Chartered Accountant (The Institute of Chartered Accountants in England and Wales) and a graduate of the Australian Institute of Company Directors. Mr Todd was appointed a Director on 16 September 2014. During the three year period to the end of the financial year, Mr Todd has held a directorship in Paringa Resources Limited (May 2014 – Present). Mr Pearce is a Chartered Accountant and is currently a Director of several listed companies that operate in the resources sector. He has had considerable experience in the formation and development of listed resource companies. Mr Pearce is also a Fellow of the Institute of Chartered Secretaries and Administrators and a Fellow of the Financial Services Institute of Australasia. Mr Pearce was appointed a Director of the Company on 25 August 2011. During the three year period to the end of the financial year, Mr Pearce has held directorships in Constellation Resources Limited (July 2016 – present), Apollo Minerals Limited (July 2016 – present), Salt Lake Potash Limited (August 2014 – present), Equatorial Resources Limited (November 2009 – present), Sovereign Metals Limited (July 2006 – present), Odyssey Energy Limited (September 2005 – present), Piedmont Lithium Limited (September 2009 – August 2018) and Syntonic Limited (April 2010 – October 2016). Mr Hannigan was the Chief Executive Officer of Aston Resources from 2010 to 2011. During this time, the company significantly progressed the Maules Creek project, including upgrades to the project’s resources and reserves, completion of all technical and design work for the Definitive Feasibility Study, negotiation of two major project stake sales and joint venture agreements, securement of port and rail access and progression of planning approvals to final stages. Mr Hannigan has worked internationally in the mining and resources sector for over 18 years with Aston Resources, Xstrata Coal, Hanson PLC, BHP Billiton and MIM. Mr Hannigan was appointed as Alternate for Mr Thomas Todd on 16 September 2014. During the three year period to the end of the financial year, Mr Hannigan has held a directorship in Paringa Resources Limited (May 2014 – Present). Mr Browne is a Chartered Accountant and Associate Member of the Governance Institute of Australia (Chartered Secretary) who is currently Company Secretary for a number of ASX and European listed companies that operate in the resources sector. He commenced his career at a large international accounting firm and has since been involved with a number of exploration and development companies operating in the resources sector, based from London and Perth, including Apollo Minerals Limited, Berkeley Energia Limited and Papillon Resources Limited. Mr Browne successfully listed Prairie on the Main Board of the London Stock Exchange and the Warsaw Stock Exchange in 2015 and recently oversaw Berkeley’s listings on the Main Board LSE and the Madrid, Barcelona, Bilboa and Valencia Stock Exchanges. Mr Browne was appointed Company Secretary of the Company on 25 October 2012. The principal activities of the Group during the financial year consisted of the exploration and development of Debiensko and Jan Karski. No significant change in nature of these activities occurred during the year. The Group’s operations are subject to various environmental laws and regulations under the relevant government’s legislation. Full compliance with these laws and regulations is regarded as a minimum standard for all operations to achieve. Instances of environmental non-compliance by an operation are identified either by external compliance audits or inspections by relevant government authorities. There have been no significant known breaches by the Group during the financial year. No dividends were paid or declared since the start of the financial year. No recommendation for payment of dividends has been made (2017: nil). (iv) On 30 May 2018, the Company announced that Loan Note 1 issued to CD Capital had converted via the issue of 44,776,120 Ordinary Shares and 22,388,060 CD Options. · the state of affairs, in financial years subsequent to 30 June 2018, of the Consolidated Entity. 1 “Ordinary Shares” means fully paid Ordinary Shares in the capital of the Company. 2 “Incentive Options” means an option to subscribe for one Ordinary Share in the capital of the Company. 3 “Performance Rights” means Performance Rights issued by the Company that convert to one Ordinary Share in the capital of the Company upon vesting of various performance conditions. 4 As founder and controller of CD Capital, Ms Daniele also has an interest in a convertible note (Loan Note 2) and the right of CD Capital to acquire 5,711,804 Ordinary shares through the issue of a $0.46 convertible note. 5 As part of the investment agreement completed with CD Capital in September 2015 and following conversion of Loan Note 1 in May 2018, CD Capital were issued with 22,388,060 unlisted options exercisable at $0.60 each on or before 30 May 2021 (CD Options). · Convertible loan note with a principal amount of $2,627,430, convertible into 5,711,805 ordinary shares at a conversion price of $0.46 per share with no expiry date (Loan Note 2). During the year ended 30 June 2018, nil Ordinary Shares have been issued as a result of the exercise of Incentive Options, nil Ordinary Shares have been issued as a result of the conversion of Performance Rights and 44,776,120 Ordinary Shares were issued on conversion of Loan Note 1. Subsequent to year end and up until the date of this report, nil Ordinary Shares have been issued as a result of the exercise of Incentive Options, nil Ordinary Shares have been issued as a result of the conversion of Performance Rights and nil Ordinary Shares have been issued on the conversion of Loan Note 2 or the CD Options. The Constitution of the Company requires the Company, to the extent permitted by law, to indemnify any person who is or has been a Director or officer of the Company or Group for any liability caused as such a Director or officer and any legal costs incurred by a Director or officer in defending an action for any liability caused as such a Director or officer. During or since the end of the financial year, no amounts have been paid by the Company or Group in relation to the above indemnities. During the financial year, an annualised insurance premium was paid to provide adequate insurance cover for directors and officers against any potential liability and the associated legal costs of a proceeding. To the extent permitted by law, the Company has agreed to indemnify its auditors, Ernst & Young, as part of the terms of its audit engagement agreement against claims by third parties arising from the audit (for an unspecified amount). No payment has been made to indemnify Ernst & Young during or since the financial year. This Remuneration Report, which forms part of the Directors’ Report, sets out information about the remuneration of Key Management Personnel (“KMP”) of the Group. Unless otherwise disclosed, the KMP held their position from 1 July 2017 until the date of this report. (c) other than profit which may be generated from asset sales, the Company does not expect to be undertaking profitable operations until sometime after the commencement of commercial production on any of its projects. The Group’s remuneration policy is to provide a fixed remuneration component and a performance-based component (short term incentive and long term incentive). The Board believes that this remuneration policy is appropriate given the considerations discussed in the section above and is appropriate in aligning executives’ objectives with shareholder and business objectives. Fixed remuneration consists of base salaries, as well as employer contributions to superannuation funds and other non-cash benefits. Non-cash benefits may include provision of car parking and health care benefits. Fixed remuneration is reviewed annually by the Board. The process consists of a review of company and individual performance, relevant comparative remuneration externally and internally and, where appropriate, external advice on policies and practices. Some executives are entitled to an annual cash incentive payment upon achieving various key performance indicators (“KPI’s”), as set by the Board. Having regard to the current size, nature and opportunities of the Company, the Board has determined that these KPI’s will include measures such as successful commencement and/or completion of exploration activities (e.g. commencement/completion of exploration programs within budgeted timeframes and costs), establishment of government relationship (e.g. establish and maintain sound working relationships with government and officialdom), development activities (e.g. completion of infrastructure studies and commercial agreements), corporate activities (e.g. recruitment of key personnel and representation of the company at international conferences) and business development activities (e.g. corporate transactions and capital raisings). These measures were chosen as the Board believes they represent the key drivers in the short and medium-term success of the Company’s development. On an annual basis, and subsequent to year end, the Board assesses performance against each individual executive’s KPI criteria. During the 2018 financial year, a total cash incentive of $134,361 (2017: $256,487) was paid, or is payable, to KMP on achievement of KPIs as set by the Board which included: (i) completed drilling at Jan Karski which re-affirmed the capability of the project to produce SSCC; (ii) permitting activities continued at Jan Karski including submission of an ESIA and approval of spatial development plans; and (iii) mine site redevelopment planning continued at Debiensko including advancement of demolition works pre-qualification of study contractors and preparation for an infill drill program to increase JORC Measured and Indicated Resources. The Group has adopted a long-term incentive plan (“LTIP”) comprising the “Prairie Employee and Contractors Performance Rights Plan” (the “Plan”) to reward KMP and key staff (including eligible employees and contractors) for long-term performance. Shareholders approved the Plan in November 2013 at an Annual General Meeting of Shareholders and on 17 August 2017 shareholders approved an amended and renewal of the Plan. The Plan provides for the issuance of unlisted Performance Rights which, upon satisfaction of the relevant performance conditions attached to the Performance Rights, will result in the issue of an Ordinary Share for each Performance Right. Performance Rights are issued for no consideration and no amount is payable upon conversion thereof. (d) provide incentives to eligible employees and contractors of the Plan to focus on superior performance that creates Shareholder value. Performance Rights granted under the Plan to eligible participants will be linked to the achievement by the Company of certain performance conditions as determined by the Board from time to time. These performance conditions must be satisfied in order for the Performance Rights to vest. The Performance Rights also vest where there is a change of control of the Company. Upon Performance Rights vesting, Ordinary Shares are automatically issued for no consideration. If a performance condition of a Performance Right is not achieved by the expiry date then the Performance Right will lapse. (c) Decision to Commence Underground Mining Construction means a Board decision for the commencement of construction activities (including securing adequate project finance to enable construction to commence) for Debiensko (including but not limited the commencement of ground breaking for the construction of infrastructure, coal processing and/or coal breaker station facilities), in accordance with the activities outlined in the project development schedule and budget approved by the Board and forming part of a technical study before 31 December 2020. In addition, the Group may choose to provide unlisted Incentive Options to some KMP as part of their remuneration and incentive arrangements in order to attract and retain their services and to provide an incentive linked to the performance of the Group. The Board’s policy is to grant Incentive Options to KMP with exercise prices at or above market share price (at the time of agreement). As such, any Incentive Options granted to KMP are generally only of benefit if the KMP performed to the level whereby the value of the Group increased sufficiently to warrant exercising the Incentive Options granted. Other than service-based vesting conditions (if any), there are generally no additional performance criteria attached to any Incentive Options granted to KMP, as given the speculative nature of the Group’s activities and the small management team responsible for its running, it is considered that the performance of the KMP and the performance and value of the Group are closely related. The Company prohibits executives entering into arrangements to limit their exposure to Incentive Options and Performance Rights granted as part of their remuneration package. The Board’s policy is for fees to Non-Executive Directors to be no greater than market rates for comparable companies for time, commitment and responsibilities. Given the current size, nature and risks of the Company, Incentive Options may also be used to attract and retain Non-Executive Directors. The Board determines payments to the Non-Executive Directors and reviews their remuneration annually, based on market practice, duties and accountability. Independent external advice is sought when required. The maximum aggregate amount of fees that can be paid to Non-Executive Directors is subject to approval by shareholders at a General Meeting. Director’s fees paid to Non-Executive Directors accrue on a daily basis. Fees for Non-Executive Directors are not linked to the performance of the economic entity. However, to align Directors’ interests with shareholder interests, the Directors are encouraged to hold shares in the Company and given the current size, nature and opportunities of the Company, Non-Executive Directors may receive Incentive Options in order to secure and retain their services. Fees for the Chairman were set at $36,000 per annum (2017: $36,000) (excluding post-employment benefits). Fees for Non-Executive Directors’ were set at $20,000 per annum (2017: $20,000) (excluding post-employment benefits). These fees cover main board activities only. Non-Executive Directors may receive additional remuneration for other services provided to the Company, including but not limited to, membership of committees. During the 2018 financial year, no Incentive Options or Performance Rights were granted to Non-Executive Directors. The Company prohibits Non-Executive Directors entering into arrangements to limit their exposure to Incentive Options granted as part of their remuneration package. During the Company’s exploration and development phases of its business, the Board anticipates that the Company will retain earnings (if any) and other cash resources for the exploration and development of its resource projects. Accordingly, the Company does not currently have a policy with respect to the payment of dividends and returns of capital. Therefore there was no relationship between the Board’s policy for determining, or in relation to, the nature and amount of remuneration of KMP and dividends paid and returns of capital by the Company during the current and previous four financial years. The Board did not determine, and in relation to, the nature and amount of remuneration of the KMP by reference to changes in the price at which shares in the Company traded between the beginning and end of the current and the previous four financial years. Discretionary annual cash incentive payments are based upon achieving various non-financial key performance indicators as detailed under “Performance Based Remuneration – Short Term Incentive” and are not based on share price or earnings. However, as noted above, certain KMP may receive Incentive Options in the future which generally will be of greater value to KMP if the value of the Company’s shares increases sufficiently to warrant exercising the Incentive Options. As discussed above, the Company is currently undertaking exploration and development activities, and does not expect to be undertaking profitable operations (other than by way of material asset sales, none of which is currently planned) until sometime after the successful commercialisation, production and sales of commodities from one or more of its projects. Accordingly the Board does not consider earnings during the current and previous four financial years when determining, and in relation to, the nature and amount of remuneration of KMP. 1 During the year Ms Daniele waived her Non-Executive Director remuneration. 1 For details on the valuation of the Incentive Options and Performance Rights, including models and assumptions used, please refer to Note 19 to the financial statements. 2 Each Incentive Option or Performance Right converts into one Ordinary Share of Prairie Mining Limited. 3 Vest on satisfaction of the Debiensko Feasibility Study milestone. 4 Vest on satisfaction of the Decision to Commence Underground Mining Construction at Debiensko Milestone. 5 Vest on satisfaction of the Decision to Commence Construction at Jan Karski Milestone. There were no Incentive Options granted or exercised by any KMP of the Group during the 2018 financial year. During the financial year, Mr Stoikovich signed an updated appointment letter dated 21 June 2018, under the terms of which he agrees to serve as a Director of the Company. Mr Stoikovich’s appointment letter is terminable, pursuant to the Company’s Constitution, by giving the Company notice in writing. Under the updated appointment letter, Mr Stoikovich receives a fixed fee of £25,000 per annum. During the financial year, Windellama Capital Limited, a company of which Mr Stoikovich is a director and shareholder, had a consulting agreement with the Company to provide project management and capital raising services (CEO services) related to Debiensko and Jan Karski. 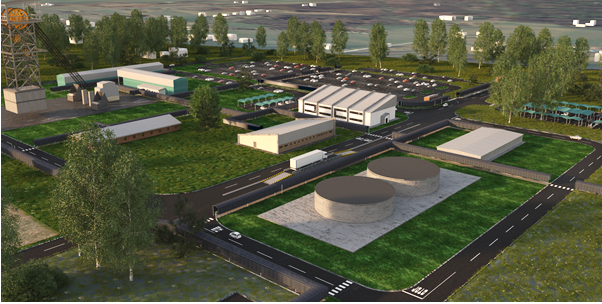 Under this agreement, Windellama Capital Limited is paid a fixed annual consultancy fee of £225,000 per annum and an annual incentive payment of up to £100,000 payable upon the successful completion of key project milestones as determined by the Board. In addition, Windellama Capital Limited, subject to meeting the requirements of the Corporations Act and where necessary receiving the appropriate approvals, was entitled to receive a payment incentive worth the annual fixed directors fees and consultancy fee in the event of a change of control clause being triggered with the Company. The consulting contract could be terminated by either Windellama Capital Limited or the Company by giving twelve months’ notice. No amount was payable to Windellama in the event of termination of the contract arising from negligence or incompetence in regard to the performance of services specified in the contract. Mr Taras, was appointed as Group Executive – Poland on 13 October 2016. He has a consultancy agreement with the Company dated 1 March 2015 and amended effective 1 September 2015, which provides for a consulting fee of PLN22,500 per month for strategic advisory services. The contract may be terminated by either party by giving one months’ notice. Mr Taras also receives a fixed Management Board fee for PD Co sp. z o.o. (Jan Karski) of PLN4,400 per month. Mr Simon Kersey, Chief Financial Officer, is engaged under a consultancy deed with Cheyney Resources Limited (“Cheyney”) dated 1 April 2017. The agreement specifies the duties and obligations to be fulfilled by Mr Kersey as the Chief Financial Officer. The Company may terminate the agreement with three months written notice. No amount is payable in the event of termination for material breach of contract, gross misconduct or neglect. Cheyney receives an annual consultancy fee of £160,000 and will be eligible for a cash incentive of up to £50,000 per annum to be paid upon successful completion of KPIs. In addition, Cheyney, will be entitled to receive a payment incentive worth 6 months of the annual consultancy fee in the event of a change of control clause being triggered with the Company. Mr Browne, Company Secretary, had a letter of appointment dated 1 October 2015 confirming the terms and conditions of his appointment. Mr Browne’s appointment letter was terminable pursuant to the Company’s Constitution and he received a fee of £6,000 per annum pursuant to this appointment letter. In addition, Candyl Limited (“Candyl”), a company of which Mr Browne was a director and shareholder, had a consultancy agreement with the Company, which specified the duties and obligations to be fulfilled by Mr Browne as the Company Secretary. Either party could terminate the agreement with three months written notice. No amount was payable in the event of termination for material breach of contract, gross misconduct or neglect. Candyl received an annual consultancy fee of £63,000. Both the appointment letter and Candyl consulting agreement were terminated effective 31 October 2017. On 1 November 2017, Mr Browne entered into a new consulting agreement which specified the duties and obligations to be fulfilled by Mr Browne as the Company Secretary. Either party can terminate the new agreement with three months written notice or payment in lieu. No amount is payable in the event of termination for material breach of contract, gross misconduct or neglect. Under the new consultancy agreement, Mr Browne receives a consultancy fee of $10,000 per month. No loans were provided to or received from Key Management Personnel during the year ended 30 June 2018 (2017: Nil). Apollo Group Pty Ltd, a Company of which Mr Mark Pearce is a Director and beneficial shareholder, was paid or is payable $150,000 (2017: $150,000) for the provision of serviced office facilities and administration services. The amount is based on a monthly retainer of $12,500 (2017: $12,500) due and payable in advance, with no fixed term, and is able to be terminated by either party with one month’s notice. This item has been recognised as an expense in the Statement of Profit or Loss and other Comprehensive Income. At 30 June 2018, $12,500 (2017: $12,500) was included as a current liability in the Statement of Financial Position. From 1 July 2018, the monthly retainer was altered to $20,000 per month. As founder and controller of CD Capital, Ms Daniele has an interest in 22,388,060 $0.60 CD Options (which may result in the issue of an additional 22,388,060 Ordinary Shares) and an interest for CD Capital to convert Loan Note 2 into 5,711,804 Ordinary shares through the issue of the $0.46 convertible note. 1 Forfeiture of Performance Rights on 31 December 2017 as the performance conditions had not been achieved prior to the expiry date. 2 On 30 June 2018, 1,400,000 Incentive Options held jointly by Mr Todd and Mr Hannigan which were granted to them on 10 September 2014 expired. 3 As founder and controller of CD Capital, Ms Daniele was deemed to have an interest in the CD Options issued to CD Capital following conversion of Loan Note 1 during the year. 2 As founder and controller of CD Capital, Ms Daniele was deemed to have an interest in the 44,776,120 Ordinary Shares issued to CD Capital on conversion of Loan Note 1 during the year. There were no Board committees during the financial year. The Board as a whole currently performs the functions of an Audit Committee, Risk Committee, Nomination Committee, and Remuneration Committee, however this will be reviewed should the size and nature of the Company’s activities change. Non-audit services provided by our auditors, Ernst & Young and related entities, are set out below. The Directors are satisfied that the provision of non-audit services is compatible with the general standard of independence for auditors imposed by the Corporations Act. The nature and scope of each type of non-audit service provided means that auditor independence was not compromised. No dividends have been declared, provided for or paid in respect of the financial year ended 30 June 2018 (2017: nil). The lead auditor’s independence declaration for the year ended 30 June 2018 has been received and can be found on page 22 of the Directors’ Report in the Annual Report. The information in this report that relates to Exploration Results was extracted from Prairie’s announcement dated 21 February 2018 entitled “Drill Results Affirm Jan Karski’s Status As A Globally Significant Semi-Soft (Type 34) Coking Coal Project” which is available to view on the Company’s website at www.pdz.com.au. The information in the original announcement that relates to Exploration Results is based on, and fairly represents information compiled or reviewed by Mr Jonathan O’Dell, a Competent Person who is a Member of The Australasian Institute of Mining and Metallurgy. Mr O’Dell is a part time consultant of the Company. Mr O’Dell has sufficient experience that is relevant to the style of mineralisation and type of deposit under consideration and to the activity which he is undertaking to qualify as a Competent Person as defined in the 2012 Edition of the ‘Australasian Code for Reporting of Exploration Results, Mineral Resources and Ore Reserves’. Prairie confirms that: a) it is not aware of any new information or data that materially affects the information included in the original announcements; b) all material assumptions and technical parameters of the Exploration Results included in the original announcements continue to apply and have not materially changed; and c) the form and context in which the relevant Competent Persons’ findings are presented in this presentation have not been materially modified from the original announcements. KATOWICE, Poland (Reuters) – Poland’s state-run JSW (JSW.WA) is awaiting approval from the Energy Ministry in its bid to acquire the Polish mining assets of Australia’s Prairie Mining (PDZ.AX), JSW said on Wednesday. Prairie Mining has been developing coking coal projects at the Jan Karski mine in southeast Poland and the Debiensko mine in Silesia, Poland’s industrial heartland in the south. JSW has said it wants to increase its coking coal output. “We maintain that we would like to take over Prairie Mining assets, however we still need to obtain the owner’s approvals, which means that the Energy Ministry opinion is necessary,” JSW Chief Executive Daniel Ozon told Reuters. “This is why it is unlikely that the whole process of assessing Prairie Mining assets will finish in September,” he said, adding he hoped the process would be completed in October. He did not give a value for any transaction. Prairie Mining has a market capitalization of A$79 million ($57 million). Sources told Reuters this month that JSW, which has been in talks on cooperation with the Australian firm for much of this year, wanted a controlling stake in Prairie Mining to tighten its grip as the EU’s biggest coking coal miner.Ozon declined to comment on that issue. The Energy Ministry, which supervises the mining industry, had planned to dismiss Ozon last week after disagreements over strategy but a meeting of the supervisory board in which this was expected to take place was canceled last week, sources said. JSW declined to comment on the meeting. Ozon also declined to comment on the matter. Energy Minister Krzysztof Tchorzewski told Reuters last week that he was familiar with JSW’s plan to take over Prairie Mining but declined to provide details. Listed coking coal miner JSW is working on the asset valuation of peer Prairie Mining #PDZ and expects to announce its further decisions on the subject in mid-September, CEO Daniel Ozon told reporters. “The legal audits are being finalized and, together with advisors, we are working on asset valuation,” Ozon said, adding that the completed technical audits of the projects Debiensko and Jan Karski showed that both these projects meet JSW’s expectations as to the quality of coal. “We will be informing of further steps likely in mid-September,” Ozon also said. In July Ozon said JSW expected to make a decision on possible cooperation with Prairie Mining or purchase of Prairie assets by the end of August. In early June Ozon told PAP JSW is in talks with Prairie Mining regarding potential investment in Prairie assets. JSW’s options include taking over Prairie Mining as a whole, or particular assets, because mining licenses belong to subsidiaries, not the firm itself, he said at the time. Further to Prairie Mining Limited’s #PDZ announcement on 29 March 2018 on the possible co-operation between Prairie and Jastrzębska Spółka Węglowa SA (“JSW”), Prairie notes recent press articles regarding comments by representatives from JSW on possible transaction(s) between the Company and JSW with respect to Prairie’s Polish coal projects. The Company advises that discussions continue to take place as part of the exchange of technical and commercial information as referenced in the Company’s announcement on 29 March 2018. Commercial discussions continue to be at a preliminary stage and that even if they move onto discussions of specific transactions terms there can be no certainty as to whether any transaction(s) will be agreed, or the potential form of such transaction(s). The Company expects further exchange of information will continue with JSW. The Company will continue to comply with its continuous disclosure obligations and will make announcements to the market as required. Further meetings were held between the Company and JSW while Prairie has made available information to JSW in relation to both the Debiensko and Jan Karski mines to allow JSW to conduct assessments of their feasibility and economics. In a recent statement made by JSW, they disclosed that they expect to make a decision on any potential transaction with Prairie by the end of August 2018. There can be no certainty as to whether any transaction(s) will be agreed, or the potential form of such transaction(s). The Company will continue to comply with its continuous disclosure obligations and will make announcements to the market as required. the decision provides security of tenure over the Jan Karski concessions and effectively safeguards Prairie’s rights at the project until full court proceedings are concluded. The Lublin Regional Director for the Environment issued an official notification indicating that the process to establish an Environmental Consent decision for Jan Karski would be extended past 30 June 2018 due to further information requests to supplement Prairie’s original Environmental and Social Impact Assessment and ongoing local authority and public consultations. · Prairie remains in a financially strong position with cash reserves of A$11 million. The Jan Karski Mine (“Jan Karski”) is a large scale semi-soft coking coal project located in the Lublin Coal Basin in south east Poland. The Lublin Coal Basin is an established coal producing province which is well serviced by modern and highly efficient infrastructure, offering the potential for low capital intensity mine development. Jan Karski is situated adjacent to the Bogdanka coal mine which has been in commercial production since 1982 and is the lowest cost hard coal producer in Europe. On 3 April 2018, Prairie announced that it had commenced legal proceedings against Poland’s Ministry of Environment (“MoE”) due to its failure to grant Prairie a Mining Usufruct Agreement over the concessions which form the Jan Karski Mine and in order to protect the Company’s security of tenure over the project. As discussed above, in April 2018, Prairie commenced legal action against the MoE for breaching the Polish Geological and Mining Law (2011) (“GML”) in relation to the award of a Mining Usufruct Agreement to Prairie at Jan Karski. Prairie completed an Environmental and Social Impact Assessment and made submissions to the Lublin Regional Director for the Environment (“RDOS”) for an Environmental Consent decision for Jan Karski in October 2017. During the quarter, the RDOS issued a notice indicating that the Environmental Proceedings would be delayed further, subject to the receipt of additional information requested by the RDOS which the Company, together with its appointed environmental consultants, are working to provide. During the quarter, there was a change of personnel fulfilling the functions of the Chairman and Deputy Chairman of the Lublin RDOS. Prairie and JSW have entered into a Non-Disclosure Agreement (“NDA”) with respect to potential co-operation regarding Prairie’s two Polish coal projects. The purpose of the NDA is to allow for the exchange of technical and commercial information in order to facilitate substantial and more advanced discussions regarding any potential transaction(s) options in respect of Prairie’s projects. Prairie will make available information in relation to the hard coking coal project under the Debiensko concession, to allow JSW to conduct an assessment of its feasibility and economics, taking into consideration factors including, but not limited to: its stage of development, conditions of the mining concession, environmental permits, and the mining usufruct contract. JSW will also assess other various risks and opportunities, including JSW’s existing infrastructure at the neighbouring Knurów-Szczygłowice mine. Prairie will also make available to JSW information in relation to the Jan Karski project in the Lublin Coal Basin, to allow JSW to conduct an assessment of the project’s feasibility and economics regarding coking coal, taking into consideration factors including, but not limited to: its phase of development, the physical and chemical parameters of the coal (in particular its coking parameters), the timeframe and conditions with regards to obligations to obtain a mining concession, as well as other various risks and opportunities. It is emphasised that any potential transaction(s), should they occur, may be subject to a number of conditions including, but not limited to, obtaining positive evaluations and expert opinions, necessary corporate approvals, consents and approvals related to funding, consents from Poland’s Office of Competition and Consumer Protection (UOKiK) if required, and any other requirements that may relate to the strategy, objectives and regulatory regimes applicable to either Prairie Mining or JSW. In a recent statement made by JSW, they disclosed that they expect to make a decision on any potential transaction with Prairie by the end of August 2018. There can be no certainty as to whether any transaction(s) will be agreed, or the potential form of such transaction(s). The NDA, signed at the end of March 2018, provides for discussions to be conducted for an initial period up to 6 months, which may be extended by mutual agreement of both parties. The companies will continue to comply with their respective disclosure obligations to the relevant markets, as required. Prairie has cash reserves of A$11 million. With CD Capital’s right to invest a further A$68 million as a cornerstone investor, Prairie is in a strong financial position to progress with its planned activities at Debiensko and Jan Karski. During the quarter, the convertible loan note held by CD Capital with a principal amount of A$15 million was converted into 44.8 million ordinary shares and the subsequent issue of 22.4 million A$0.60 unlisted options. However, as of the date of this quarterly, Prairie has not yet received the required Environmental Consent decision, which remains pending. Prairie completed an Environmental and Social Impact Assessment and made submissions to RDOS for an Environmental Consent decision in October 2017. Prairie has not been able to apply for a Mining Concession for Jan Karski due to the delay in the issuance of an Environmental Consent decision. However, the Environmental Consent proceedings continue to progress and the Company has received notice from the RDOS to provide supplementary information to the originally submitted Environmental & Social Impact Assessment. The approval of Prairie’s Geological Documentation in 2015 also conferred upon Prairie the legal right to apply for a Mining Usufruct Agreement over Jan Karski for an additional 12-month period beyond April 2018, which precludes any other parties being granted any licence over all or part of the Jan Karski concessions. Under Polish law, the MoE is strictly obligated, within three months of Prairie making an application for a Mining Usufruct Agreement, to grant the agreement. It should be noted that the MoE confirmed Prairie’s priority right in two written statements (i.e. in a final administrative decision dated 11 February 2016 and in a formal letter dated 13 April 2016). Prairie applied to the MoE for a Mining Usufruct Agreement over Jan Karski in late December 2017. As of the date of this quarterly the MoE has not made available to Prairie a Mining Usufruct Agreement for Jan Karski, therefore breaching the three-month obligatory period for the agreement to be concluded. Legal advice provided to Prairie concludes that failure of the MoE to grant Prairie the Mining Usufruct Agreement is a breach of Polish law. Accordingly, the Company commenced legal proceedings against the MoE through the Polish courts in order to protect the Company’s security of tenure over the Jan Karski concessions. Since the MoE has not provided a decision within three months regarding Prairie’s Mining Usufruct application, the Polish civil court has the power to enforce conclusion of a Usufruct Agreement in place of the MoE. In the event that a Mining Usufruct Agreement is not made available to the Company on acceptable terms or the Company does not enter into a Mining Usufruct Agreement for any other reason, other parties may be able to apply for exploration or mining rights for all or part of the Jan Karski concession area. However, given that the Civil Court has approved Prairie’s motion for an injunction against the MoE, as described above, the MoE is now prevented from entering into a Usufruct agreement or concession with any other party besides Prairie until the full court proceedings are concluded. JSW assumes that by the end of July it will decide on the assets of Prairie Mining – informed the president Daniel Ozon. “I assume that by the end of July we will be after full analysis and technical reports and reports from legal and financial advisors and at the end of July we will probably make such a decision “– said the president of JSW. At the end of March, JSW reported on the conclusion of an agreement with Prairie Mining on the potential establishment of cooperation on Prairie coal projects in Poland . Prairie was to provide information about the coking coal mining project in the Dębieńsko-1 concession and information about the Jan Karski project in the Lublin Coal Basin. “For several weeks, including advisors, we have audited these concessions and are investigating the state of their legal status,” Ozon said. He added that it is not simple, among others due to disputes with Bogdanka’s management regarding Jan Karski. “The next stage we would possibly go through is price-related issues and price negotiations, if we find out that these assets are interesting to us,” he said. He repeated that there are various scenarios: cooperation with Prairie Mining, takeover of one or both projects or total abandonment of these concessions. Ozon informed that, theoretically, for the Dębieńsko-1 deposit, JSW can reach from the Szczygłowice mine. The total resources of this deposit are estimated at 301 million tonnes, and the resources shown to be acquired at 93 million tonnes. The planned service life is about 50 years. “Potentially, we could consider the scenario that in the first phase of exploitation we are able to extract coal without the need to build a shaft and infrastructure, using the Szczygłowice infrastructure, and at the same time build the shaft to start production at full steam around 2-2.5 million tonnes annually, “said Ozon. “The Dębina concession in potentially two stages of accessibility is interesting for us, because it enables fairly rapid entry into decks and production in the first phase, without major investment outlays, to 0.5 million tonnes of coal,” added JSW. He informed that in the case of the Jan Karski mine project, total resources are estimated at 728 million tons of coal, and resources indicated for acquisition at 352 million tons. JSW informed PAP Biznes several weeks ago that after the results for the first half of the year the company could enter the US market with the issue of bonds and ends talks with banks regarding a syndicated loan in the amount of approx. PLN 1 billion in refinancing on the domestic market. On Friday, Ozon said the issue of bonds is being analyzed. “As for debt refinancing, in the summer we should finalize a five-year syndicated loan,” said Ozon. Further to Prairie Mining #PDZ announcement on 29 March 2018 on the possible co-operation between Prairie and Jastrzębska Spółka Węglowa SA (“JSW”), Prairie notes recent press articles regarding comments by representatives from JSW on possible transaction(s) between the Company and JSW with respect to Prairie’s Polish coal projects.